Dog/OC embodies the Happiness and Love of all that is Good about Life. Dog engages the Whole of the Experience. Everything that is part of the One thing it Loves is worthy of its own investigation. Human’s relationship with the Dog is our closest comparison to an exchange of Unconditional Love. The Dog is a creature of Opportunity that sees to its own immediate happiness. Though, the Dog brings back the treasure it Loves, along with the scent of a trail that others can choose to follow. Dog balances the Wisdom of defending itself, while still standing behind one another’s right to Choose. Dog Loves the Whole Pack, like it Loves the Whole Creation. It shows a Way by making Happy Choices and Loving without conditions. Tone 12 is the Tone of Understanding. On Tone 12 we comprehend the Meaning of Truth as Knowledge is taken from the head to the heart. The Flint/ETZNAB trecena served to sweep our path clear of all the false truth that stood in the way of seeing things as they Really Are. Today we can see how One Truth of Unconditional Love is all we need to sweep our fears away. The only Truth we need to know is that a Creator of Almighty Authority created us to Love. The Love of a Supreme Creator WILL find its way to create our Heaven on Earth. The Truth that Flint Intended us to Understand is revealed by Offering/MULUC. MULUC symbolizes the Atonement that is made possible through a Sacred Offering. Through an Offering, Human demonstrates its Faith in Divinity. An Offering Shines a Light of Believing in a Higher Love, one that offers a Provision for Human’s Happiness on Earth. Through an Offering we See and Acknowledge that we have already been blessed. An Offering is the Divine Intention to give something back. 12 Offering/MULUC is a day when our Heart Knows how much we have to be Grateful For. We Want to Pay Back and Pay Forward the Blessing. MULUC is a symbol of Water Everywhere from the Cosmos to our own Tears. MULUC holds the Element of Fire that ignites our Emotions. Today a Blessing is Given through Holy Water that will Heal our Emotions. Through an Atonement with the Creator we can see our Self as we are Seen from Above. Today we will shine our Highest Light as our Heart is broken by Unconditional Love. Tone 11 intends a Resolution of Truth. Like a set of Divine Antennae, we’re tuned-in for a Clear Transmission of Truth. The Truth we grasp today, will Resolve our Dream for the Future. We have been crystallizing the Truth that Human is capable to see through the Wisdom of an Experience. The 7th uinal is the axis mundi, the whirling cauldron of creation that exists at the threshold between the Above and the Below. One realm Divinely Draws into the other the image of the Perfect Reflection of Truth. At the zero-point, we see All that is on one side of the scale, and All that is Not on the other side. Only, from a pinnacle view we will see it All Around. We can see our Self at the Center of a Universe all our own. Star/LAMAT identifies Human as the Personification of Light. We’re made of Stars in the image of the Brightest Light in our Lives. Like a Star, our Light is meant to shine equally in all directions. LAMAT’s totem is the Rabbit, a cauldron of Creation that Overflows with Love. Rabbit reflects our unlimited potential for creation motivated by Love. Star/LAMAT is said to be a day of “pure luck” for it’s ability to Multiply any object of our Affection to Abundance. LAMAT is a Day Sign of “instant manifestation” that multiplies whatever we focus on. The Flint/ETZNAB trecena is all about Truth. Rabbit can multiply our Gift of Knowing, when our Divine Truth is the focus of our thoughts. LAMAT is a symbol of Venus, the brightest Heavenly Light next to the Sun and the Moon. Venus shines as the Morning and Evening Star in rotating cycles of Light. Venus is a Star that can be seen both in Darkness and Light, bright enough by it’s own Power to be Seen right next to the Sun. Tone 10 holds the Intention of Manifestation. On Tone 10 we manifest the Truth of Higher Consciousness. Manifestation is a Blessing that holds a responsibility. Manifestation requires us to See and Acknowledge that the Creation is Real. The Manifestation of our Dreams always presents a challenge. Every creation begins as a Dream in our Imagination. We must claim the Dream that exists “in waiting” for it to be delivered into a material world. We have to Believe it Before we can See it. Deer/MANIK is the Day Sign of Spiritual Tools. MANIK embodies the Vigilant Observation of the Deer. MANIK upholds the Pillars of Faith with one foot firmly planted in each of the 4 directions. The Deer uses its Vigilant Observation to Call on Love in the Moment. Deer stands on its own Truth of Love, Believing it will find whatever it looks for. The Deer doesn’t have to explain how it knows, others See the Truth as Deer goes through the motions of Love. Deer/MANIK is the bringer of Spiritual Tools. 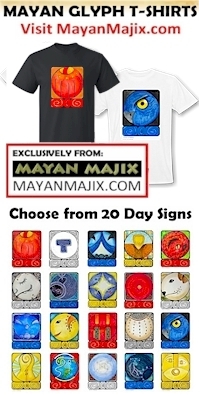 As the Destiny of the Mayan priest, MANIK carries out the rituals and sacred ceremonies on behalf of the Whole. The Deer follows its own Truth with Vigilant Observation in all the 4 directions. When we see One light the candle of a prayer, we want to light one too. Believing their prayers can be answered, we believe in our own. The MANIK glyph illustrates the Hand grasping the thread of Light to complete a circuit of Divine Power. MANIK shares a thread of Hope. Human’s LAST Hope is ALWAYS Answered Prayer. On Tone 7 we arrive in the Balancing Place, that holds the Great Law of Creation, “As Above, So Below.” From the Peak of a New Climb of Faith we are given a Vision of All That Is, and all That Isn’t. ALL our Fears of the Future are opposed to the Divine Destiny created for us. Seed/KAN marks the 7th Tone of the 7th Uinal of Seeing and Knowing Truth. We are a Seed that was given a Consciousness To Be. We are Seeds of the Most Divine Thoughts that were manifested Below, as Above – Heavenly Lights. Light would illustrate Below in a form manifested of Earth. In the beginning there was only the Darkness of all the Possibilities. Like a Black Hole, it gathered all the Light and Love of ALL the possibilities, until on the Breath of Holy Wind, the Dream Above was separated from the One Mind into a Universe of Lights and Possibilities. Seed/KAN offers a clearing of Karma. The Dragon is a symbol of “Seeing Clearly.” Like CHICCHAN, the Serpent, ours will be a Divine Sense of Knowing by Vibration. We’re free of any attachments from the Past as we create a new Seed. A New Seed will hold the same integrity of Choice. Like every new generation, we won’t be attached to an old perspective – reasons we did things in the past. We no longer have to go along with any ways of the world. We don’t owe anything. Everything is a Brand New Choice. MASTER NUMBER 777: Tone 7, Uinal 7, and Kin 124 reflect the Master Number 777, amplifying the Intention of a Divine Balancing. Number 777 is a highly spiritual number that resonates as spiritual consciousness, awakening, spiritual enlightenment, spiritual acceptance and development, mysticism, intuition and inner-knowing, inner-wisdom, empathic abilities, psychic abilities, the esoteric, the inner-self, deep contemplation and introspection, eccentric, religion, thoughtfulness, understanding others, natural healer and healing, secrets, myth, ritual, peace, poise, emotions and feelings, inner-strength, endurance and perseverance, persistence of purpose, the ability to bear hardships, solitary, isolation, long-sighted, the non-conformist, independence and individualism. 777 magnifies the Consciousness of discernment and discerning, knowledge-seeking, study, education and learning, evolution, stability, the ability to set limits, completion, refinement, stoicism, silence, perfection, chastity, dignity, rigor, and ahead of the times. Angel Number 777 indicates that you have listened to Divine guidance and are now putting that wisdom to work in your life, and the time has come to reap the rewards for your hard work and efforts.